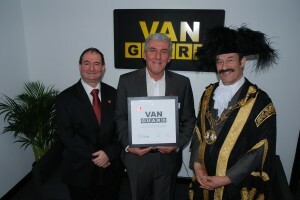 On Thursday 5 February, commercial vehicle accessories manufacturer Van Guard held a VIP event at its Exeter Headquarters to celebrate its membership in the Made in Britain Campaign. This follows Van Guard’s decision to reshore a large element of its manufacturing process to the UK, backing British Manufacturing while creating jobs and future-proofing its business. In attendance were the Lord Mayor of Exeter, Percy Prowse, and the Lady Mayoress, members of ExIST and representatives from Exeter College and the University of Exeter as well as some of Van Guard’s top UK distributors. The visitors were treated to a tour of the factory, a demonstration of Van Guard’s state-of-the-art laser cutting machinery and the official presentation of the Made in Britain certificate by Adrian Walker, a Made in Britain Director. The VIP event was rounded off with a delicious top quality bacon or sausage buttie and cup of builder’s tea from Kenniford Farm, while the distributors went on to Woodbury Park Hotel for an official meeting and the premiere of Van Guard’s two new promotional films, one featuring a well-known face from the construction industry, Roger Bisby.